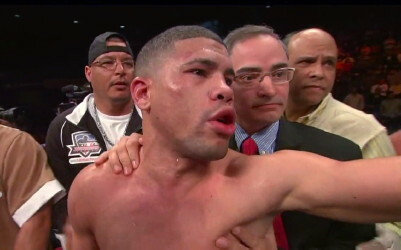 By Dan Ambrose: Former WBO featherweight champion Juan Manuel Lopez (31-1, 28 KO’s) wants more than anything to avenge his knockout loss from last year when he faces WBO featherweight champion Orlando Salido (37-11-2, 25 KO’s) in their rematch on March 10th at the Coliseo Roberto Clemente, in San Juan, Puerto Rico. Lopez’s promoter Bob Arum has likely warned him about the wisdom of facing Salido after how badly Lopez was battered by the tough Mexican last April in an 8th round TKO defeat in front of his own fans in Bayamon, Puerto Rico. Lopez thought he was going to steamroll Salido like he had done with the other fodder that Arum had pumped his record up with, but Saldio wasn’t having any of that. He took some of Lopez’s big left hand shots in the early rounds and then begin to fire back on him with big right hands that found their mark over and over again. Lopez, who has never had much of a chin, looked like one of AMC’s Walking Dead, as he moved around the ring like a zombie taking right hand after right. From the 6th round on, it was only a matter of time before Salido put Lopez out of his misery. Thankfully, the referee was caring enough to halt the massacre before Lopez got seriously hurt. The rematch is set for next month on March 10th and Lopez is foolishly putting his career on the line in taking this fight. He’s trained really hard and is looking in great shape. However, it’s not about being in great shape; it’s about having skills and a great chin to take Salido’s powerful shots. Sadly, Lopez doesn’t have the skills or the chin to beat Salido and will almost surely get knocked out again. What worries me is whether the referee will allow Lopez to soak up a lot of punishment in this fight rather than doing the compassionate thing by saving him from the right hands from Salido.